During the fall semester, my class worked on submissions for a contest sponsored by the Bill & Melinda Gates Foundation called Records for Life. The challenge concentrated on rethinking and redesigning the global child health and immunization record — no small task! Child health records are something every parent needs — no matter where they live — to ensure their child receives life-saving vaccines they need to live a healthy productive life. However, many families never receive health records for their children, or, if they do receive them, they can be easily destroyed or lost. In many cases, records are not accurately maintained because they are designed in a confusing way or are not adaptable as new vaccines become available. Accurate and accessible records are needed to maintain health histories for children, identify those who need to be immunized, and those who have missed immunizations or are off schedule. When the record is unclear, inaccessible or unused, it’s harder to reach children with life-saving vaccines. The Records for Life contest was launched to address these key challenges. 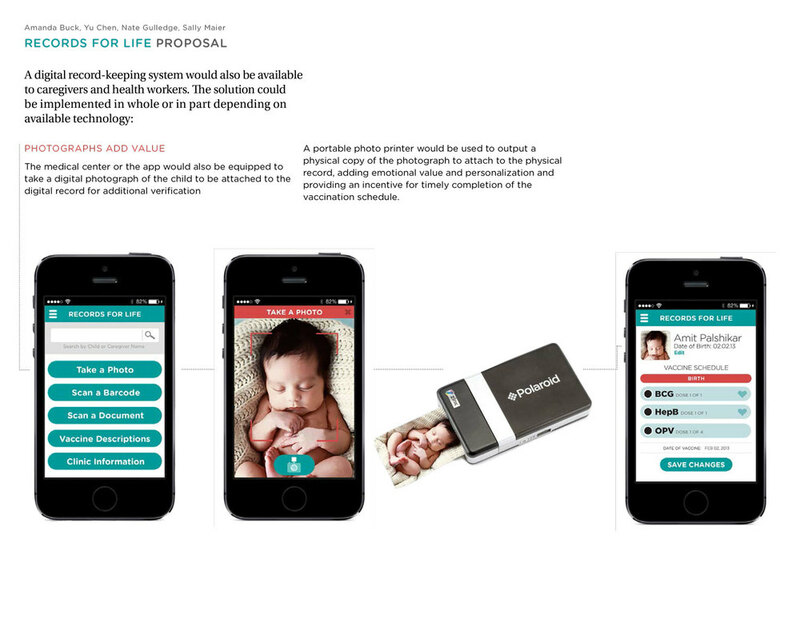 Our project was led and guided by Jennifer Cole Phillips, Director, Graphic Design MFA Program, with guest advisors Islam Elsedoudi, IDEO; Doug Storey and Manish Arora, Johns Hopkins Bloomberg School of Public Health; and Lee Davis, MASD. We kicked it off with a weekend workshop led by visiting designer Islam Elsedoudi of IDEO (Thanks, Islam!). Together we brainstormed, prototyped, and created narratives to gain a better understanding of the experiences that caregivers, health workers, and government survey-takers have with current child health records. It's not really a brainstorm without lots of colored Post-Its. We then divided ourselves into teams to continue working on the project post-weekend workshop. My team included myself, Nate Gulledge, Sally Maier, and Yu Chen. Our proposal attempted to address the issues outlined above. We focused on instilling a sense of value to the record itself and creating redundancy in the record keeping process, through a hybrid of high- and low- tech solutions. 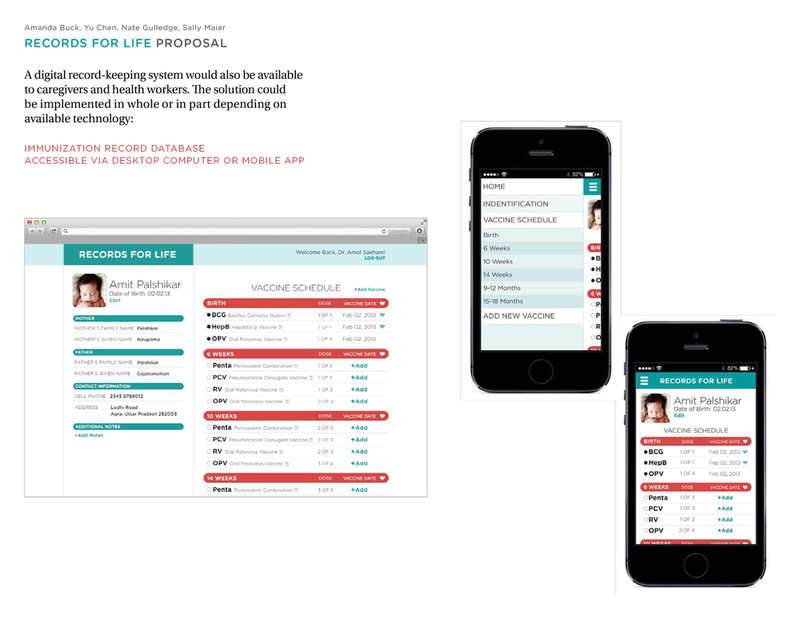 Our proposal is a clear, adaptable, portable, durable, and valuable solution for both health workers and caregivers. By utilizing optical mark recognition, the form simplifies record keeping and allows for easy reproduction and digitization, adding scalability and redundancy in the medical data system. 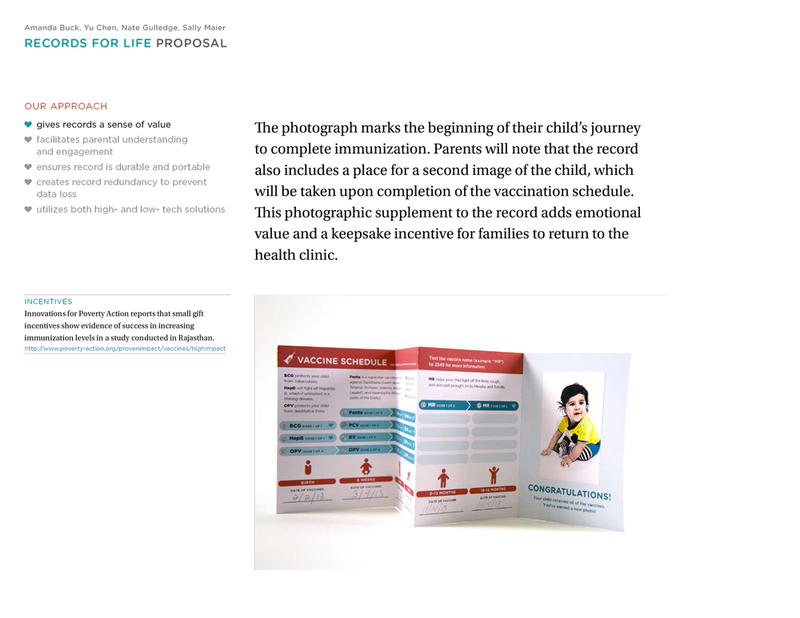 An initial cover photograph adds value to the record, and the promise of a final photograph creates an incentive towards completion of the vaccination cycle. Plus, when technology is available, text-message based reminders and information can help encourage family compliance and vaccination comprehension. There were over 300 submissions from 41 countries, and the Gates Foundation tested the top 40 prototypes in focus groups around the world. MICA had two team semifinalists (in the top 40). And remarkably, my team was also top-ten finalist, as well as a top-tier Honorable Mention winner, coming in after the Grand Prize winner, gravitytank – an innovation consultancy in Chicago. My classmate Nate represented our team this past week in Amsterdam at the IxDA conference, where the winners were announced. Thank you, Nate! The Gates Foundation will be posting more information about the contest in the coming weeks on their blog, Impatient Optimists. There is the possibility that part or all of our proposal will actually be implemented. Please click on the thumbnails below to see and read more about our submission. I am super proud of our team!